She was looking at us from behind a large blue poster board as we streamed into the reception area. “Excuse me! Can someone help me?” I did a second take and went over to her. All she wanted was for someone to take her picture next to her Voices of the Year poster. After I took her picture, I begged her to take my picture, even though I didn’t know where my own poster was. 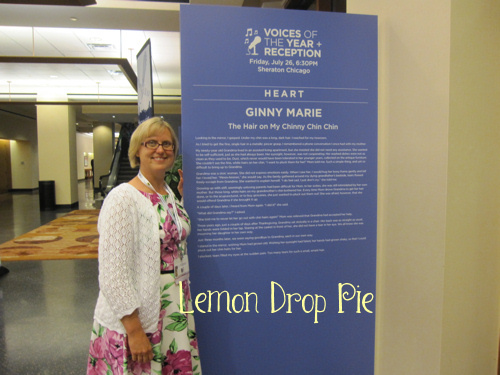 I turned around, and I saw “Ginny Marie” right next to hers! I wish I had taken the time to see what her name was, since she took this great picture of me below. Thank you to my fellow YOTY honoree…where ever you are! I just loved reading all these BIG BLUE posters! I spent a lot of time standing in front of them. I was determined not to run away to my hotel room too soon! (Mostly because I didn’t know that many people…but I did run into Ellen and Erin from The Sisterhood of the Sensible Moms. They are great!) One of the things I noticed about of these honored posts is that they were printed, word for word, onto the posters. Many of them included a QUESTION at the end…but there was no place to leave a comment. Reader comments…just one of the reasons I keep on blogging! Going to BlogHer makes me want to type my heart out and share everything I learned while I was there. However, there are only so many hours in the day and I really need my sleep. After wearing my Blogger Hat, I put on my Mommy Hat and threw a kitty party for 26 little girls and 1 little boy. Emmy turned six last week! This morning, I’m putting on my VBS Hat, and am going to welcome 60 kids to our church this morning. It was lovely to meet you at the newbie breakfast at BlogHer. Congrats on VOTY! I’m enjoying getting to know your blog! I feel like I just wear a family hat all summer. I see so much family that I don’t normally see the rest of the year. WOW!!!!!!!! Well you just inspire me soooooooooooo much! I am so impressed and so happy for you..way to go girl!! That’s a great photo! Were you allowed to take the big blue sign home and display to all your family and friends? Great smile, great dress and great blue GIANT poster of your words! What a wonderful way to honor you and the others with making what you wrote larger than life. Good luck this week with VBS! Many hats myself. Writer hats, photographer hats, mama hats, baking hats, gardening hats, cleaning hats. So many hats I don’t usually wear so they feel a little funny, but it’s been a summer of discovery for sure. How cool is that to have one of your blog posts on a giant poster. Congrats! That is a great picture of you too! I am so excited to know that I was actually sitting next to one of the winners! Congratulations!!! You are a busy lady and I hope the birthday party and VBS were just AWESOME! Thank you! I’m usually not this busy, it’s just how the calendar happened to end up this year! One day of VBS down, 4 more to go. So far, so good! How cool to see your blog post on a giant poster! Can’t believe I didn’t know you were a VOTY winner. My BlogHer roomie was one of the readers (the story about her biracial son asking if he would sit at the front or the back of the bus) and took her poster with her after the reception. After she got back to the hotel room she realized she couldn’t get it on the airplane! I’m still not sure if she found a way to get it home. Congratulations to you and your Big Blue. Also, can you add a link to the winning post? Love that dress on you! Congrats again!